Shale gas ‘is not needed to ensure the UK’s security of supply’. 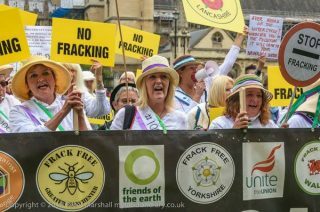 On Monday dozens of women dressed as Suffragettes are expected to travel from across the country to a rally outside this year’s Conservative party conference in Birmingham to highlight public opposition to fracking and the proposed changes to planning permission for sites. Women living near Cuadrilla’s shale gas site in Lancashire will be among them. Ruth Owens, a mother from Thornton in Lancashire who will be travelling to Birmingham, told Drill or Drop: “Fracking is being forced on our communities against the wishes of local people and democratically-elected Councillors. They will be gathering outside a fringe event on energy security at which the energy minister, Claire Perry MP, is expected to speak. On open letter was sent to Claire Perry earlier this month disputing what she said in Parliament on 12 September. I write further to your responses given in the above debate at Westminster Hall on Wednesday, 12th September 2018 which I watched on ParliamentLive TV. I’m sorry to say that I found you to be patronising, self-contradictory, ill-informed and largely ignorant of the fracking process and its environmental and social impacts. Indeed, you used this debate more to justify your party position on fracking than address the controversy surrounding your planning proposals which was the topic under discussion. You may recall that at the last election the Conservative Party lost 32 seats and their overall majority. The party remains in power only due to the purchased support of the DUP. To then suggest that the Party has a clear mandate to enact their more contentious manifesto promises is disingenuous at best. You went on to assure the Hall that you were “a passionate advocate of convincing people of the scientific evidence of climate change, and everything my department has done is based on scientific evidence and I find it profoundly disturbing that when it comes to exploring an industry…exploring the potential of an industry…we refuse to accept science. “I have met and continue to engage with many of the scientists who are putting out various studies relating to fugitive methane emissions, relating to the seismicity question – which is of course concerning – and what I find fundamentally is when you talk to any of those scientists is…behind that…is an aversion to using any form of fossil fuel”. In other words you find it profoundly disturbing that people accept any science that runs contrary to your opinion. Whilst I accept that it is deeply inconvenient to accept these scientific findings, they cannot be dismissed out of hand. Your task should be to investigate the options available because of their conclusions, not try to disprove them for political expediency. I do not know from where you get such ridiculous fallacies but whoever is entrusted with your research is breathtakingly incompetent. In 2014, 12 months before the planning hearing, Lancashire County Council had received more than 5000 objections from residents to the Roseacre Wood proposal alone. Since that date resistance has hardened; I know from personal experience that of the 100-200 protesters regularly found at the site 15-20 are from outside Lancashire, the rest are all locals. It is deplorable that you should be prepared to utter blatant lies without first checking the veracity of your claim. These locals are some of the same Fylde residents who travelled from their homes in support of the debate in Westminster Hall. Your refusal to travel to Lancashire to hear for yourself the effect of your policies is unacceptable. Refusing to walk outside the rarified confines of Westminster Palace to listen to those who have made a round trip of over 500 miles is inexcusable. The Fylde is traditionally a Conservative constituency boasting the 6th safest Tory seat in the country. Those living in the hamlets and villages surrounding the sites earmarked for fracking development are drawn largely from social groups A and B. They have researched projects, evaluated findings and enacted appropriate strategy throughout their working lives. They have brought this experience to bear in researching the validity of fracking over the last 4½ years and have determined that there is only one sensible conclusion: onshore shale exploration and production has no place in a densely populated island like the UK. In the light of the increasing evidence of its role in climate change, the reality is it should not be countenanced anywhere. Your economy with the truth was further evidenced by your citing foreign countries from which we obtain gas with a reference to “the events in Salisbury”. Politicians seem very keen to perpetuate the myth that a significant quantity of our gas comes from Russia. As you are aware less than 1 per cent of our needs are met by Russian imports. Your claim that any shale gas which may be produced in England would belong to the UK is similarly misleading. The UK is part of an integrated European energy market, so gas produced in the UK is traded on the open market and sold to the highest bidder. If private companies can earn more money by exporting they will. In 2016 UK companies exported 25 per cent of the gas we produced. Your overarching suggestion that English shale gas will somehow lower CO2 emissions and act as a clean bridging fuel is the most dangerously spurious of all your submissions. Scientists have repeatedly stressed that English shale gas can only reduce CO2 emissions if it replaces other fuels. Any shale gas produced in England will be in addition to the energy mix which we currently enjoy. As repeated studies have proved, 6000 productive shale gas wells will be required to provide 50 per cent of the gas we currently import. Any gas this may replace will simply be sold elsewhere. By repeating these claims, you are continuing to mislead both the public and parliament. Increasing numbers of people are becoming more aware of the dangers of fracking. There is nowhere in the country that shale gas planning applications have gone unopposed. I don’t know by what sleight of hand those who don’t have a view suddenly translate to being supporters of shale gas, but you have also failed to mention the 19 per cent who said that they were opposed to shale. Seemingly these figures are taken from the BEIS Wave 25 survey. Presumably, learning that the number opposing shale gas has now reached 32 per cent and continues to rise, explains the reason that you have dropped the question from the quarterly tracker, now asking only whether people are aware of fracking. As opposition to fracking has grown, you have failed to heed the warnings of scientists and concerns of citizens, instead choosing to perpetuate the lies and misinformation fed to you by the likes of Chris Faulkner, the founder, CEO and president of the Dallas-based oil and gas company Breitling Energy and currently languishing in an American prison awaiting trial on charges of securities fraud, mail fraud and money laundering, in connection with a scheme to defraud investors of millions of dollars. As affected people have sought to highlight their concerns and fears you have changed the law to criminalise their actions whilst lauding and supporting the cancer that threatens them. You now claim that to see that democracy can run its proper course you are removing the democratic right to be heard, the democratic right to participate in the planning process and the democratic right to protest. Lord Haw-Haw himself would have blanched at such hypocrisy. This letter was supported by the signatures of Tina Louise Rothery Julie Daniels Diane Langford Christine Dorothy Katharine Gleaves Pam FosterKatrina Louise TaylorKate Adams Linda Foord Harriette Dew Bunny la RocheLorraine Inglis Mary Sullivan Kate Adams Anna Grear Johnny Linehan John Hobson David Rees Jon Eldude Stuart Jeffery Tim Valentine Rosemary Rechter Jonathan Flaig Ian Driver Andy Latham Andy Rowell Lorenzo Obi Abadinas Damien Short Barbara Richardson Dan Allen Chris Weller Chris StonePauline Frederica Kiernan Shernaz Dinshaw Jon O’Houston and Pat Davies. Feel free to forward it to your MP if they are Conservative.